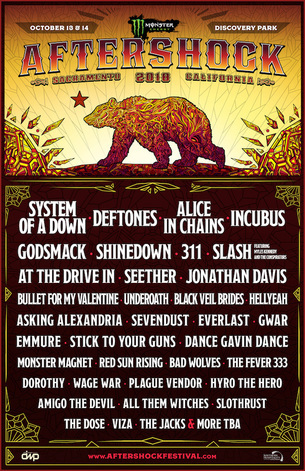 The Monster Energy Aftershock Festival is coming back to California this year. The annual festival is scheduled to be held October 13 and 14 at Sacramento’s Discovery Park. Now in its seventh year, the festival will be headlined this year by System of a Down, Alice in Chains and Deftones. This year marks the first time that System of a Down has performed at the festival. Along with being the band’s first year at the festival, System of a Down’s performance at the Aftershock Festival will also be the band’s first announced U.S. appearance in three years. It is also part of the band’s 20th anniversary celebration of its landmark self-titled album’s release. 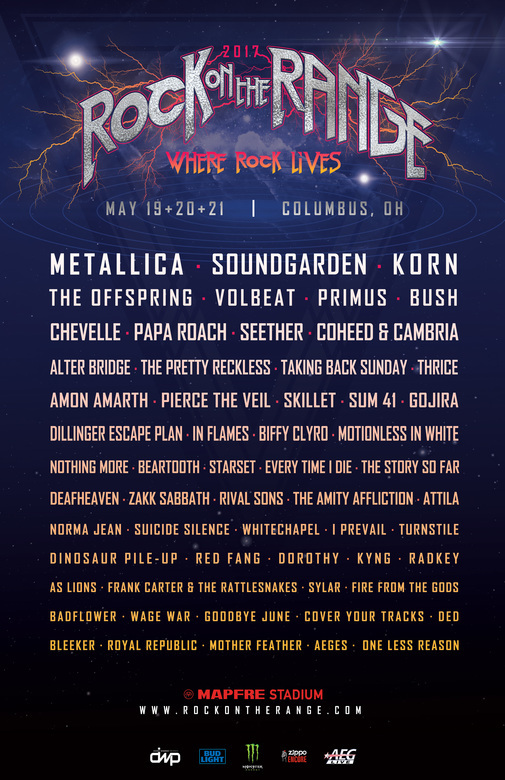 While System of a Down, Alice in Chains and Deftones are the two-day festival’s planned headliners, they are not the only bands on the bill. Also scheduled for the performance are Godsmack (which is currently touring in support of its brand new album When Legends Rise), Incubus, Seether, Jonathan Davis (whose latest solo album Black Labyrinth is scheduled for release May 25), At The Drive-In and Slash ft. Myles Kennedy and the Conspirators (who are currently working on their latest album) as well as Bullet For my Valentine (whose new album Gravity is scheduled to be released June 29), Sevendust (whose album All I See Is War is out now) and many more. The full lineup for this year’s festival is noted below. Providing food for this year’s festival will be a variety of vendors including: Southern Hospitality Concessions LLC, Danny Wimmer Presents’ affiliate concessionaire. Food trucks will also be on hand, providing savory and sweet treats from: Angry Bird Grill, Bacon Mania, Barrett’s Burgers, Barrett’s Sliders, Big Joe’s BBQ, Bubba’s BBQ, Cousins Maine Lobster, Dippin Dots Ice Cream, Dogtown, Drewski’s Hot Rod Sandwiches, Florez Bar & Grill, La Mex Taqueria, Mac Attack, Mount Olympus, Sausage King, Smokin’ Hot Pizza, Spicy Pie and Xochimilco Mexican Restaurant. Beverages will be available from a variety of vendors, including vendors for festival-goers 21 and older. Those vendors include: Caduceus Vellars & Merkin Vineyards Wine Garden (owned by Tool/A Perfect Circle/ Puscifer front man Maynard James Keenan) and the Belching Beaver Bar (featuring drafts from the Vista, CA brewer including the Phantom Bride IPA, a collaboration with the Defones). Mrkt N Jolt will also be on site, offering hot coffee, cold brew and other items. As if the music, food and drink isn’t enough for festival-goers, this year’s festival will also offer lots of entertainment options. Those options include the Monster Energy Experience, which gives audiences the chance to meet and greet the bands while also sampling the festival’s various offered drinks, The Music Experience, which is an interactive exhibit and music instrument retailer. Non-profit animal rescue organization Take Me Home will also be on-site along with Dyin 2 Live/FXck Cancer, a wish-granting organization. Fans can buy music from the festival’s bands on site at the f.y.e. Fan Experience. Festival-goers can win prizes and check out the latest products from Zippo Lighters at Zippo Encore and charge their phones at SWFTCharge. Tickets and VIP packages for this year’s festival are on-sale now. Prices are listed below. Service fees on all ticket purchases include a $0.50 charity fee for the T.J. Martell Foundation, a foundation aimed at researching and fighting cancer. Active military personnel get discounts on their tickets through GovX. VIP tickets include: VIP entrance lanes to the venue, shaded VIP hang area with seating for dining, a VIP-only viewing area of main stage, video screens featuring a live feed of main stage inside the VIP hang area, upgraded food and drink selections, dedicated VIP restrooms and commemorative VIP Monster Energy Aftershock laminate. A park & ride shuttle is being offered again for this year’s festival as parking at Discovery park is very limited. Every ticket includes parking at Sleep Train Arena and non-stop shuttle directly to the festival site. The Monster Energy Aftershock Festival is produced by Danny Wimmer Presents and fueled by Monster Energy. It is sponsored by f.y.e., Coors Light, Jack Daniels, Zippo Encore, The Music Experience, SWFTCharge, Fxck Cancer, Ace of Spades, Take Me Home and Belching Beaver. More sponsors will be announced later.